Try to stay indoors as much as possible. 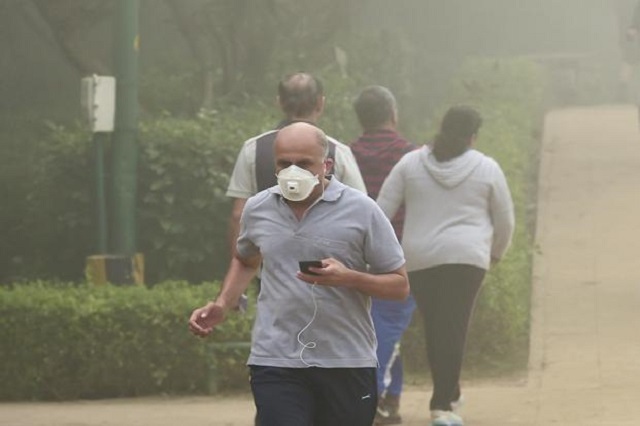 Here are some home remedies to protect yourself from deadly air pollution. Delhi is engulfed in a thick blanket of fog and smoke, known as smog. A public emergency has been declared by doctors in Delhi. The pollutants level in the air is likened to smoking at least 50 cigarettes in a single day! Imagine what levels of harm it can cause your body. We cannot reduce the already caused harm to the air quality. But with these home remedies, we can improve the immunity of our body towards these pollutants. Here are some quick remedies. Eat jaggery and incorporate it in your diet. Use olive oil to prepare food. It is documented that olive oil boosts immune system against the attack of external microorganisms. Have Tulsi and ginger infused tea twice a day. It will help strengthen your immunity. Drink 10-15 ml of Tulsi juice daily to keep your body guarded against external pollutants. Don’t forget to add a teaspoon of turmeric powder to the glass of milk you have everyday. If you don’t have milk daily, start having it already. Chew a garlic pod along with a neem leaf for better immunity. Try incorporating citrus fruits like lemon, gooseberries, oranges, etc in your diet. The vitamin C contents in the fruit boost your immunity. Add two tablespoons of desi ghee in your diet. Make sure that the ghee you’re using is pure. Eat as much as carrots and spinach these days.